My boyfriend (now husband!) bought himself a denim shirt in Korea. It’s mine now. It’s been mine since he got it. That was three years ago. At the the time, the fashion for men in Korea was tight. Everything had to be tight and fitted, even jumpers. So my husband’s shirt was poifict for me. Is poifict for me – I still wear it all the time. It goes in and out of style but the denim shirt is an essential part of a capsule wardrobe. The denim shirt is the most versatile shirt in your wardrobe. I’ve worn mine to work, hanging out around the house, to parties, going out, you name it. The denim skirt is a a fantastic jeans alternative, the denim shirt is jeans in top form. This season, double denim is being encouraged. Once disparagingly described as the Canadian tuxedo, it’s been sartorially acceptable for a while now and trend setters all over the place have perfected the look. Olivia Palermo (seen above and below) is a denim shirt aficionado. This is how to double it up. 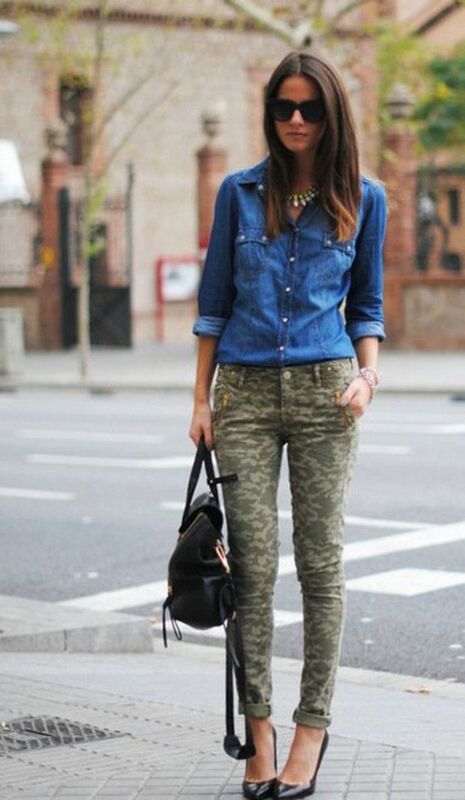 The thing about the denim shirt is that its can totally change the tone of your ensemble. Going to an event and you’re not sure of the dress code? Wear a nice skirt and a denim shirt and you are dressed up and down at the same time. Genius! I found another denim shirt this weekend when I popped back West for a quick visit. It belonged to my mother but was hanging in Aoife’s wardrobe. I was wearing a plain black outfit and the shirt thrown over it was just the thing to lift it. Add a pair of high heeled boots and I would have been as at home in a cafe for tea or a cool bar for cocktails. There are many styles of and ways to style a denim shirt and they’re all easy to wear and simple to style. You can definitely keep your denim shirt and recycle but it’s also the type of item that you can buy a new one that’s appropriate for the particular season. If you don’t have a denim shirt in your wardrobe already get one for it now. Get a good one, spend some money on it, choose a shade that suits you – you’ll have it forever. This post was updated in April 2019. Denim shirts are still everywhere, and FYI there is a really nice, soft one to be found in Dunnes at the moment! Want to see more from our Capsule Confidential series? Click here!